We packed up the house and hit the skies to the explore the world for 6 months – these are all of our adventures and misadventures. so where to from France, we headed back to London to Nelly and Phillo for some more lovely hospitality and to see a little of the countryside outside the city. so after leaving London we headed to South Africa to catch up with my very loved and missed ‘family’ and friends, unfortunately on arrival in RSA, my mum phoned to say that my Poppy had passed away, which is why we never really got back to this. it was a very sad time for me knowing that i would not get back for the funeral and that Pop wouldn’t have wanted that anyway, so i treasured the time with my ‘family’ and very very wonderful friends. We had a bit of a sleep in then went to the post office to send some souvenirs, gifts and crap home. We grabbed a baguette and sat by the Mediterranean and ate lunch. We then headed to the train station and jumped aboard a train headed for Cannes, famous for its cultural activities and many festivals. Once in Cannes we headed for the Croisette (esplanade) and wandered along it, past all the big name hotels and yuppie yappy ‘Paris Hilton’ pooches, around to the Vieux Port (marina) where many yachts/cruiser’s worth a small penny or two were moored. We wandered through the old streets past the market and 5th Ave. shops co-existing peacefully side-by-side. We headed back to Nice to make some reservations for our train trip tomorrow, with a plan to then head to Monaco. That plan however was squashed when the reservation lady advised there were no more French tickets available so we would need to go to Italy to book. So we jumped on a train and headed for Italy (a 20-40 minute trip) and made our reservations there. How wacky and wonderful is it to be in a place where you can just hop over to another country to buy a train ticket and think absolutely nothing of it! By this time the rain had appeared the sun had disappeared and we had run out of time to go to Monaco 🙁 .. We had however seen it numerous times from the train. We arrived back in nice grabbed dinner and packed ready for another days train trip. Up early for our train to nice, 3 connections a quick regional to Spiez then to Milano, then onto Nice, uneventful and not that scenic as most of the trip is through tunnels. We arrived in Nice, capital of the Riviera in the late afternoon, checked in and wandered up the famous des Anglais (esplanade) that gently follows the curved beachfront from the city centre to the airport 6km west. We walked a small part and then wove our way into the old town and back down to restaurant row – many fish options (not good for Tash!) and many somewhat expensive, so we opted for Chinese as we weren’t really that hungry after consuming 3/4 of a pizza along the train ride .. Our connections were too close to pick up food along the way and the Coop (coles) in Interlaken didn’t open till 8am, our train was at half 7, so we got a take-away pizza with dinner last night. Nice is very pretty the water is so blue just like postcards (and very flat). The esplanade is lined with palm trees and all the old palaces which are now big name hotels. They do need to start poop-scoop over here in Europe though, its quite disgusting especially seeing how “mans best friend” is allowed everywhere and there is no shortage of them! So all in all we had a lovely balmy evening – no jersey’s required tonight – wandering the streets and beachfront. It sure is nice to smell the ocean again. Pity the beach is pebbles because a walk on the sand would have been divine. Today we ‘climbed’ the Eiffel tower now 117 years old, 324m high, 1,665 steps (which we didn’t climb), 2.5 million rivets, 50 tonnes of paint to decorate it and 20,000 light bulbs to make it glitter and sparkle. The queues weren’t bad the weather pretty good and the view awesome. From the tower we headed towards the champs Élysées and Concorde back to the hostel and some interneting. 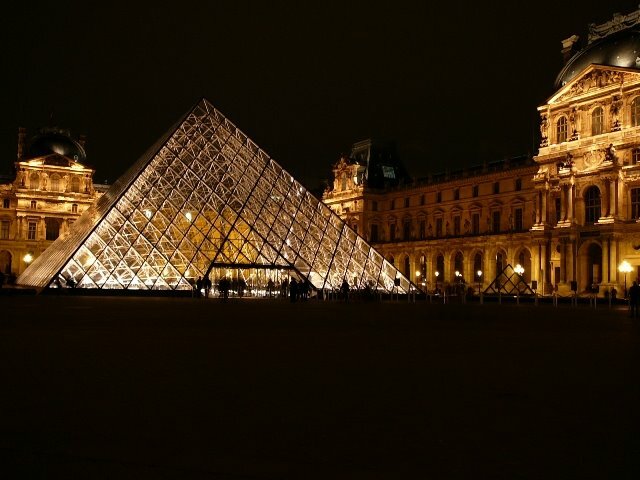 We then headed back out to Louvre Eiffel and Concorde for some night photo’s then back to hostel to watch the rugby (NZ Vs France, which NZ won). The weather today was a little better so we made tracks to Notre Dame Cathedral which is massive and built on the Îlle de la Cité site – the historic birthplace of Paris. 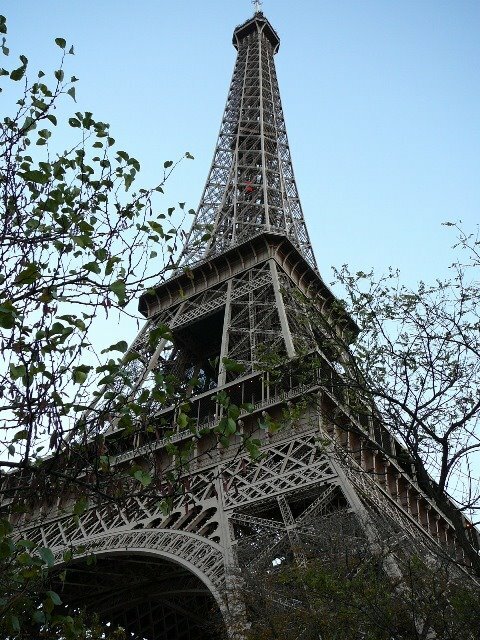 It was made famous by Victor Hugo’s novel and the musical (Les Misérables) that has toured the world. 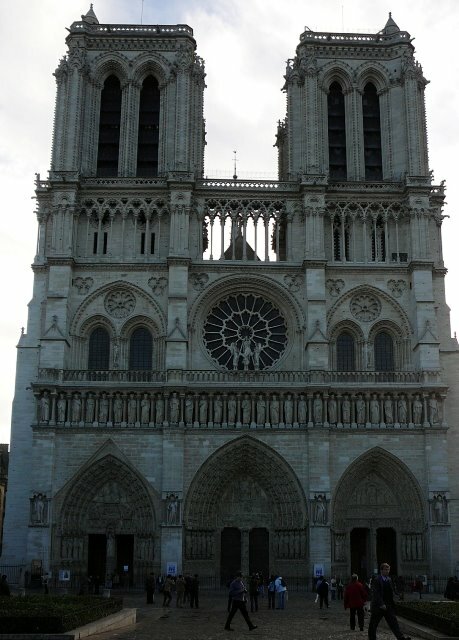 The cathedral had been an integral part of the history of the people of Paris since the 13th century. We wandered the cathedral admiring the fantastic stained glass windows. Fifteen 15m high stained-glass windows illuminate the chapel. We then climbed the tower for some magnificent views of a stunning city. After the tower we went to the cathedral’s crypt which was quite interesting. Having pretty much seen all of Notre dame we went in search of the chapelle (where henry and Marie are buried) but it wasn’t open, so we wandered around – literally because the map we had was wrong which explains why we have been struggling to find places. 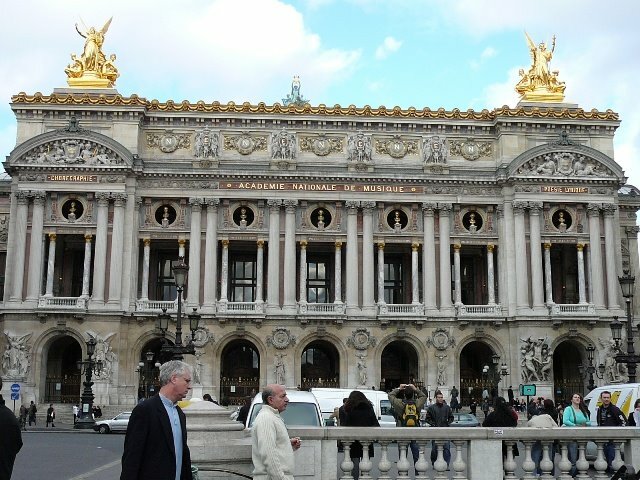 We swapped maps located the very large opera building, which we had walked all around. We then entered the subway city and had a lovely baguette and even yummier cookies ! 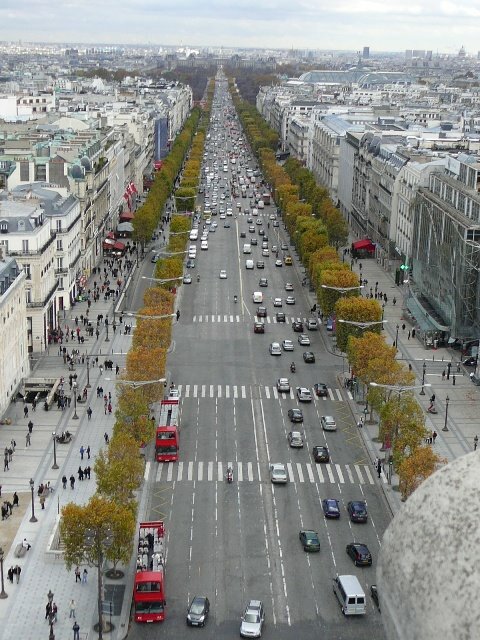 It was then up to Arc de Triomphe at Place Charles-de-Gaulle, which for many rem ains place de l’Étoile – twelve avenues radiate out from the Arc de Triomphe which stands at its centre. It was in honour of Napoleon’s victories. At 50m high and 45m wide, it is the largest construction of its type. Here we found more stairs to climb – the weather was holding off so we decided to go up even though we were tired from climbing Notre dame. The climb is definitely worth it – its awesome even when the wind is howling and the weather is not so great. After descending we walked the Champs Élysées down to Place de la Concorde which was created in 1748 to display the equestrian statue of the king, place Louis XV was renamed place de La Révolution in 1792. The statue was taken down, and during the Terror over 1,000 heads rolled here, including those of Louis XVI and Marie-Antoinette. The obelisk of Luxor on place de la Concorde is an Egyptian monument in pink granite weighing 250 tonnes, is 3,200 years old and is from the temple of Ramses II in Thebes. From de la Concorde through the jardin des tuileries to the Louvre where we caught the metro to the Eiffel tower. The line at the Eiffel wasn’t too bad but the wind was picking up and the temperature dropping so we decided against going up, instead wandering around and under it taking some pictures. We then headed back to the hostel for an early night to rest our weary legs.